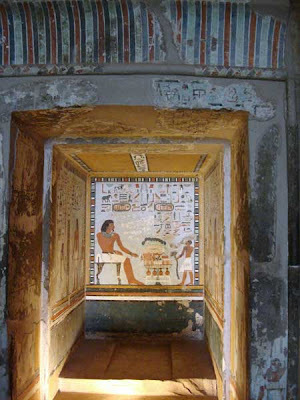 This tomb, belonging to the grandson of Sirenput I, who was a prince in the reigns of Amenemhet II and Senusert II, is one of the most well-preserved of the Middle Kingdom. 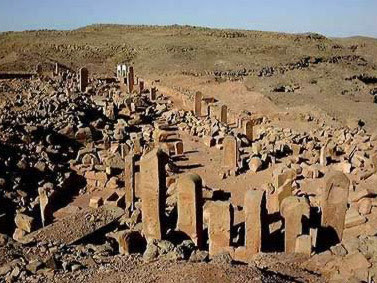 It is entered through a courtyard leading to a narrow passage, an excavated hall with six elegant square undecorated columns, and a corridor with three recesses on each side, each containing a statue of the deceased sculpted from the living rock. The small hall at the end of the corridor has four pillars and a recess at the rear. The condition of the reliefs in the recess is excellent, both the delicately worked hieroglyphics and the delightful family scenes. To the rear, the deceased is seated at a table. His son stands before him bearing flowers. On the right-hand wall is a representation of his mother seated at a table with the deceased to her right. On the left-hand wall is a similar scene with his wife and son. 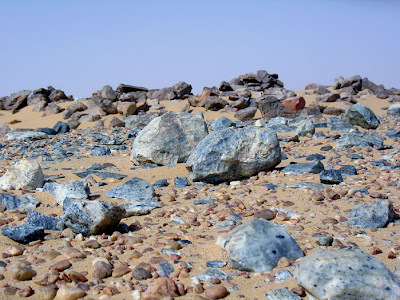 Situated in the eastern desert, directly to the south of Aswan, are the ancient quarries of granite in hues of red, yellow, brown and dark grey. Sculptors and builders for thousands of years drew their supplies from here. 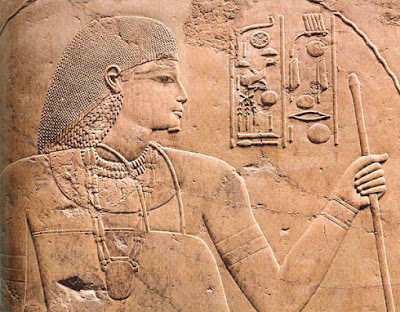 The earliest pharaoh to exploit the quarry was Den of the ist Dynasty, who used blocks for the floor of his cenotaph at Abydos. The 2nd Dynasty pharaoh Khasekhemui used it for his fine temple at Nekhen (Hierakonopolis). Then, in the Old Kingdom the quarry was fully exploited, especially by the 4th Dynasty pharaohs who raised their monuments at Giza: nine great slabs of fifty-four tons each were extracted from the quarries for the ceiling of the so-called King’s Chamber of the Pyramid of Khufu (Cheops). Red granite was choscn for the Valley, or Granite, Temple of Khafre (Cheph- ren). Black granite w'as quarried and despatched for the lower reaches of the outer casing of the Pyramid of Menkaure (Myce- rinus). Thenceforth, right through to Graeco-Roman times, the quarry was in use. Many blocks were abandoned in various stages of completion, which enables us to see the process by which the stone was extracted. Holes were bored along a prescribed straight line. It was once thought that wooden wedges were driven into these, watered and left to expand until it split the stone. Recent excavations, however, have changed our understanding of the quarrying industry. Balls of dolerite, the hardest of stone, weighing up to five-and-a- half kilogrammes, have been found in their hundreds in the area of the quarry, and it is now believed that these were attached to rammers and simultaneously struck with great force by the quarry workers. They were also used to pound and dress the surface of the stone. The system must have been reasonably sure because blocks were very often decorated on three sides.before being detached from the natural rock. The huge Unfinished Obelisk, lying in the northern quarry, is still attached to the bedrock. The reason for its abandonment is that flaws were found in the stone. An attempt was then made to extract smaller obelisks from it, but these projects, too, were abandoned. There is no indication for whom it was intended. The only marks on the surface are those of the workmen. Had it ever been completed, it would have weighed some 1,162 tons and have soared to a height of forty-two metres. In the southern quarry, rough-hewn blocks show that statues and sarcophagi were roughly shaped before transportation in order to cut down the weight. In the case of the former, the sculptor would begin to hew out the feet at a point several inches above the base of the rock, leaving the lower segment as firm support fc/r the figure. In this quarry there are two rough-shaped sarcophagi that date to the Graeco-Roman period, a rock bearing an inscription of Amenhotep III, and an unfinished colossus of a king (or Osiris) grasping a crook and flail.